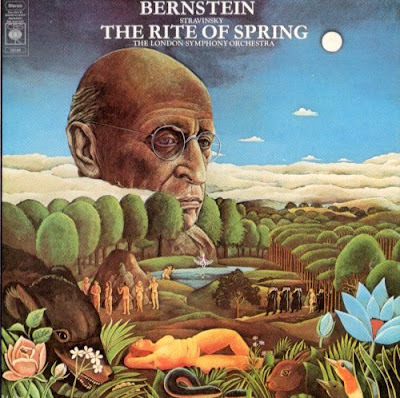 Laura's mention of 'four speakers' prompted me to feature the cover of Bernstein's 1973 CBS LP of the Rite, which was originally released in SQ quadraphonic format as well as stereo. The sleeve illustration was by that great designer Richard Hess. Once you are told that Richard Hess also invented paint-by-numbers you will see that LP sleeve in a rather different light. A very different take on Lenny's music is found on the CD below. 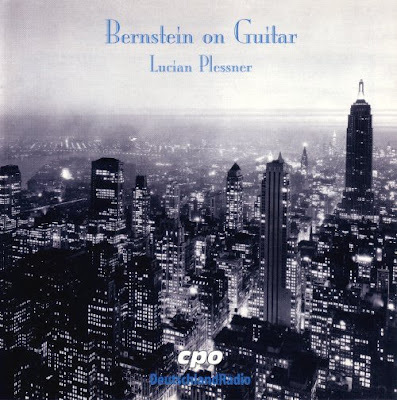 The Bernstein Estate authorised guitarist Lucian Plessner to make arrangements for guitar of a selection of his music including excerpts from Mass, Candide and West Side Story. Laura Erickson used the words 'etherally beautiful' about Mass, and that description applies equally to Lucian Plessner's transcriptions. This is haunting and intimate music making that is ideal for late-night listening. Released on the German CPO label in 1998 Leonard Bernstein on Guitar appears is deleted. But it is still available from online retailers and is well worth searching out. The last track on Leonard Bernstein on Guitar is a reduction of the Candide finale. Make Our Garden Grow may well be an unashamed crib from the close of the first act of Aaron Copland's neglected opera The Tender Land, but it is also a wonderful summation of Lenny's approach to life and music. Two years ago you wrote about the premiere of my Concerto for Orchestra, The Flames of Quietude, during a festival in The Hague with the Residentie Orkest here in Holland. One of the things I tried to do in the piece was to have five of the individual parts be playable as solo pieces, or together as chamber works, outside of the orchestral composition. Each of these "solo parts" could also be performed earlier on the same day as the orchestral composition, for the same audience, thus giving the eventual orchestra performance a sense of connection for the listener - that he or she was hearing something that already was part of his or her musical consciousness and awareness. For these five parts (Flute, Clarinet in Bb, Violin I, Cello, Piano) I also incorporated fragments, or references, to extremely recognizable and important works from the repertoire by Poulenc, Mozart, Bach, Dvorak and Beethoven. Upon hearing the references during the listening experience of the orchestral composition, one might have a sense of realization, or illumination, as new contexts would provide new meanings for already-acknowledged bits of the stuff the Western Canon is thought to be built upon (a sort of ceremony, or ritual, of the experience of concert-going, as we know it). But for the other parts within the orchestral piece, I looked for more subtle allusions to stylistically-varied works from the Past which are also a part of our collective musical awareness (and, thus, part of a listener's Present). Having tried some crazy harp-Stravinsky and some wild oboe-Thomas Newman, I wondered what to do with the Percussion players to make their parts connect to this layer of musical cosmic acknowledgement, so to speak. And then I was listening quite coincidentally to a cd performance of Bernstein's Mass, and I wound up being so surprisingly moved by it (I hadn't heard it since a live performance I had attended at Tanglewood in the '80's), I wound up quoting one particular Hebrew (but quite ubiquitous) word in a verbal utterance which is made by the four percussionists at the end of my piece. It was not Bernstein's particular use of this word which was so moving but, rather, the overall effect that this often-maligned work of Bernstein had on me, and the all-encompassing spirituality it seemed to embody. In some ways it could be considered a classic of our modern eastern/western, highbrow/lowbrow, sacred/secular, theatrical/concert repertoire, although the difficulty of placing it into a fixed category denies it a label, or functionality, as such. Anyway, I now think of it as an important part of the canon of human musical creation, and I'm glad that so many readers of On An Overgrown Path respond to it so viscerally and personally.